A rather stark and sobering teaching of the Church is that everyone of adult age on the face of this good Earth, and that means all who can discern between good and evil (which occurs sometime soon after the dawn of reason), is either in a state of grace or in a state of mortal sin, which means that should we all die this instant by some cataclysmic disaster, each one of us would go either to hell or to heaven (most of us likely via purgatory). This reality should give us pause. What this means is that we have either chosen ‘God’ as our final end (in whatever way we know Him), or we have chosen ourselves, whether under some aspect of power, wealth, pleasure or idolatry of one kind or another. Our religion is that which we have made ‘master of our affections’, as Saint Thomas puts it. There is no middle ground, as Christ states, between serving God and mammon. A large part of the confusion and obfuscation over Amoris Laetitia, and its moral and practical application, is a lack of proper distinction between this sad and tragic reality of mortal sin, and the objective nature of grave sin. Along with this is a misunderstanding of the purpose of the law and discipline of the Church in helping us tell the difference. There are various acts which are in themselves ‘grave sins’, a number of them sexual (masturbation, fornication, adultery), but many that are not (murder and grievous bodily harm, significant theft and robbery, slander, hatred of God, violation of the Church’s precepts and such). In fact, any serious violation of the commandments is ‘grave matter’, but as the perennial teaching of the Church has declared, such sins become ‘mortal’, putting our souls an enmity with God and leading to that state we call ‘hell’, only if we participate in them with full knowledge and full consent, implying that we know the implications of what we are doing, and we do it freely (cf., CCC, 1858-59). From the outside, we can never really tell, therefore, whether someone is in a state of ‘mortal sin’, for we know not the extent of their knowledge and consent, opaque to anyone but themselves. Even those who commit such sins may be only partly aware of their own state. It is in the realm of conscience, the ‘proximate norm of morality’, where ‘man is alone with God’ (cf., Veritatis Splendor, 59 ; CCC, 1776) that mortal sin does, or does not, occur. The Church teaches that we can be ‘morally certain’ that we are at rights with God, by means of a solid prayer life, a proper and regular examination of conscience, a good confession and hopefully some insightful spiritual direction. The conformity of our conscience to the truth is an ongoing task, never done once for all, but a daily endeavour, as we form ourselves ever-more into the imago Christi, with the help of Our Lady, all the saints and the Church’s Magisterium. Ah, yes, the Magisterium, the Church’s teaching office, which binds with the authority of Christ, when exercised according to certain conditions, which the Church herself has spelled out (cf., Lumen Gentium, 25). 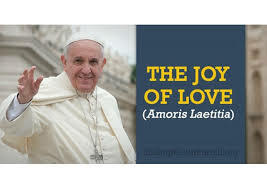 This authority, the Pope and bishops in union with him, not only teaches the truth, but also helps form our conscience with various laws and disciplines, outlined most especially and authoritatively in the Code of Canon Law. Which brings us to law, the purpose of which, as Saint Thomas teaches, is to lead us to virtue (and away from vice), whether proximately or remotely. There is the natural moral law, which binds everyone for all time, and is universal and immutable (cf. Veritatis Splendor, 69-70). The various human and many of the canonical and disciplinary laws are derived from natural law, directly or indirectly, and help us live out this more fundamental law more fully and easily. Which brings us to Amoris, and its relationship with the ‘law’ in both these senses. The Church’s Magisterium has no power to change the natural moral law (and Amoris does not do this), but it can change canonical and disciplinary laws, and it certainly can also change the application of these laws to particular circumstances, and Amoris does seem to do this, and it is here, I would posit, that the problem lies. To be clear, no one in this whole imbroglio is arguing that one can be both in a state of mortal sin and a state of grace at the same time. Such would not only be heresy, but would also violate the most basic law of non-contradiction (not to say some might attempt this). What some do seem to be arguing is that one can commit ‘grave sins’, even of the repeated and habitual variety, and still not be in mortal sin (and hence, continue in a state of grace), due to some lack of consent or knowledge. Or, at least, some are positing that the Church’s laws cannot tell whether someone is in a state of grace or mortal sin, and that, with the benefit of such uncertainty, self-discernment should therefore be left up to the individual and his conscience, with the law and the Church’s pastors as some sort of ‘guide’. Considering sin from the point of view of its matter, the ideas of death, of radical rupture with God, the supreme good, of deviation from the path that leads to God or interruption of the journey toward him (which are all ways of defining mortal sin) are linked with the idea of the gravity of sin’s objective content. Hence, in the Church’s doctrine and pastoral action, grave sin is in practice identified with mortal sin” (emphasis added). That is why when the oft-quoted Canon 915 declares that “(t)hose who have been excommunicated or interdicted after the imposition or declaration of the penalty and others obstinately persevering in manifest grave sin are not to be admitted to holy communion”, it is not saying anything infallible about the interior states of the people in these situations. Neither excommunication nor grave sin are an automatic declaration of mortal sin, and consequent eternal death should one die in such a state. They are, rather, applications of the law to help us avoid these tragic outcomes. The purpose of the law is not primarily retributive, but rather medicinal and salutary: The Church is just stating the obvious: That those who persist in grave sin are at the very least in proximate danger of mortal sin, and losing their souls and the beatific vision. Furthermore, those in such public and manifest sin who receive Communion also offer a scandal to the faithful, whose consciences may be deformed and led astray, left wondering, well, is adultery therefore really so bad? Is marriage truly indissoluble? Does cohabiting outside of matrimony exclude one from grace, Communion and ultimately eternal life with the blessed? The purpose of the Church’s law and discipline in this regard is not to ‘condemn’ those living in irregular situations, but rather to lead them to repentance and a greater life of virtue (at least in giving up their ‘vice’). To neglect or minimize the law will in all likelihood lead to the compounding sin of complaisance. That is, by ‘pleasing’ them in their sin, a lack of discipline and enforcement of the Church’s laws will in all likelihood encourage a laxity of conscience, a comfortableness with objective states of sin, with all the attendant damage to their souls, to those around them (not least the aggrieved and abandoned spouse and children), to society, to the truth of marriage and to the Church’s teaching. In other words, sin is still sin, whatever the mitigating and exculpating circumstances, knowledge and consent, and not even God can change this. There are deep metaphysical questions here, about what it means to be in a ‘state of grace’ and ‘mortal sin’, the nature of salvation, the connection between our moral actions and our eternal end and how we shape ourselves for our eternal destiny in the here and now. Many of these issues were discussed, and initial answers given, by John Paul II in Veritatis Splendor (curiously, not quoted nor referenced in Amoris), but there is still much more to be worked out. Our choice, which in the course of an entire life takes on a certain shape, can have a variety of forms. There can be people who have totally destroyed their desire for truth and readiness to love, people for whom everything has become a lie, people who have lived for hatred and have suppressed all love within themselves. This is a terrifying thought, but alarming profiles of this type can be seen in certain figures of our own history. In such people all would be beyond remedy and the destruction of good would be irrevocable: this is what we mean by the word Hell. On the other hand there can be people who are utterly pure, completely permeated by God, and thus fully open to their neighbours—people for whom communion with God even now gives direction to their entire being and whose journey towards God only brings to fulfilment what they already are. In other words, to return to the question with which we began, Benedict posits that although there are both saintly and satanic souls amongst us, most of us middling masses are immersed in some sort of (non-mortal) sins of one kind or another, albeit fundamentally in a state of grace. (To be clear, this is not a dogma, but a supposition, perhaps an echo of von Balthasar’s ‘Dare we Hope‘ hypothesis that all souls may in the end be saved). Whatever we think of this (and I would posit that hope and salvation are not essentially numerical nor statistical, but rather the mysterious result of individual and personal responses to grace) it is not difficult to discern that many souls (our own included) are indeed covered over with much compromise, even filth, and it is the task of the Church to foster what is good, noble and virtuous, not to extinguish the dimly burning wick, but fan it into flame. Pope Francis is right that we should not over-use nor too-strictly apply the law, for mercy triumphs over justice, but the Church must also be careful not to leave souls wallowing in their own ‘filth’, for the truth, especially moral truth, must be preached and practiced boldly, clearly and without compromise. It seems obvious to me that God in His good providence has left us just such ‘bold, clear and uncompromising’ truth in the teachings of Popes Benedict and John Paul II, along with all their illustrious predecessors, perhaps in preparation for our current era of confusion. Whatever current office-holders in the Church do to stretch, obfuscate or even ignore the law, with whatever good motives we may hope, we always have previous authoritative teaching as a light and guide, a beacon point and foundation in whatever ensues. Without the guidance of the Church’s doctrine and laws, our fallible and fickle conscience left on its own is no match for the Evil One, the father of lies and deceit, all-too-able and willing to exploit our own weaknesses and selfish desires. That said, it does seem as though God in this time is permitting us to be sifted like wheat, tested and tried, to see how we have appropriated and lived the Church’s teaching for ourselves, standing on our own two legs, supported by a good, solid and disciplined Catholic intellectual and spiritual formation. A glimpse at the fruits of our modern mediocre educational establishments evinces that such formation is, to put it mildly, sadly lacking. My people perish for lack of knowledge, cried the prophet Hosea, and what was true nearly three millennia ago in Israel, is perhaps even more true now. But Hosea ends his lament on a note of hope, and if we have eyes to see and ears to hear, the truth has been spoken clearly by the Truth. So have such hope, even though the storms seem set to deluge the very barque of Peter. One word from Christ, and the storm tossed seas will once again be tranquil, and we may well be asked, after the wind has subsided, why did you fear? Where, indeed, was, and is, our faith?